Each soil has specific physical and chemical properties, which enable corresponding soil processes. Depending on the functional context, one process or the interaction of a set of those processes are called Soil Functions. 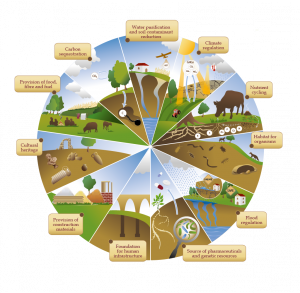 Soil Functions and Ecosystem Services attributable to soils are often used as synonyms. More exactly, however, Soil Functions enable – together with other ecosystem functions – the provision of certain, demanded Ecosystem Services. For the example of flood mitigation, this means that soils are responsible for the infiltration and therefore contribute significantly to the reduction of surface flow. The vegetation growing on the soil however, also attenuates the runoff by interception and roughness and depending on the type of floods also by transpiration.